Rewarding loyalty and making life easier for customers on the go. We built a mobile platform that gave Wawa’s customers a new way to order ahead, collect rewards, and conveniently make mobile payments. After working with Mobiquity on their incredibly successful first mobile app, Wawa, the beloved regional chain of convenience stores and gas stations, reengaged Mobiquity to evolve its Order Ahead application to align it more with Wawa’s brand standards. Customer experience is the foundation of Wawa’s culture so a user-friendly journey through order placement, payment and pick-up of fresh, fast food was a must, as was ensuring the app both looked and felt like a true extension of the Wawa brand that so many know and love. 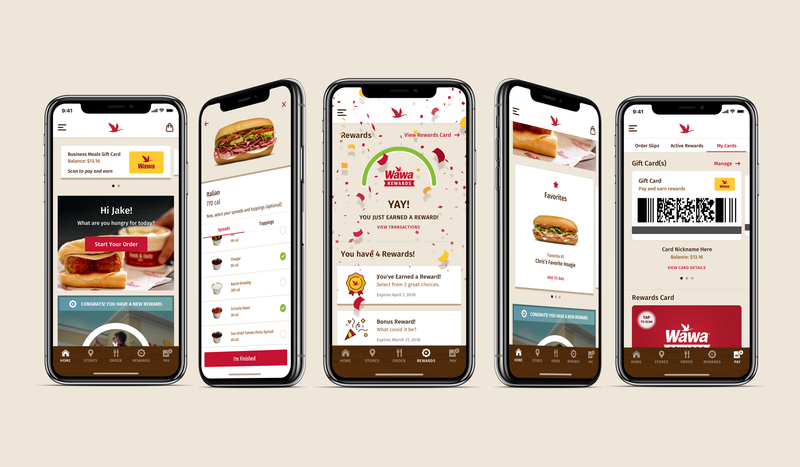 Working with the Wawa Mobile team, we redesigned the Order Ahead app from front to back to provide the best possible experience for customers. While the app retained its original features -- including the ability to order ahead or in-store, pay for purchases, and earn and redeem rewards, it received a complete overhaul throughout the design and build process. We introduced new in-app features, like a dynamic home screen and updated menu browsing, along with innovative back-end technologies to improve the app’s agility and lessen time to market for future enhancements. The end result is a more secure, convenient and consistent customer experience that serves to enhance Wawa’s much-loved brand. We are continuing to work with Wawa on its long-term evolution as it aims to be the neighborhood hub for true, community-centered convenience.